I’m a very organized person. I keep my records in order, my desk is clean and everything is filed and sorted into place. I’ve even wrote a post about how it can save you money. Unfortunately, my orderly behavior is sometimes a mask and means of procrastination. 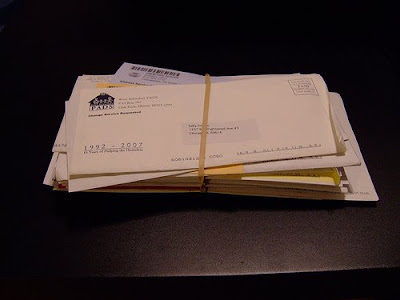 I tend to postpone dealing with the things I find least interesting and they often find themselves sitting, very neatly, in the incoming mail tray waiting to be opened, reviewed, dealt with and scanned for posterity. I’m constantly fighting the urge to procrastinate. I know it’s costly. But every now and then I fail. This is exactly what happened to me a couple of week ago. I got an envelope from one of my insurance agencies. Now as every novice personal finance enthusiast knows you should always, always immediately read and respond to any financial letter and when discussing insurance companies all the more relevant. Financial notices and letters are usually sent to us, not because these financial giants are nice and would like to keep us informed, but because it is a part of regulatory and mandatory requirements and they are obliged to do. Furthermore, these letters and notices usually have a given time frame in which we, as consumers, can respond and comment on their content, whatever it may be. I assume you understand, by now, the implications of my procrastination. That letter from that particular insurance agency contained a small insurance policy and a notice which states my policy was automatically renewed, naturally at a much higher rate. Insurance policies are costly and canceling them costs even more since you’re charged all sorts of costs in addition to the premiums you’d already paid. Had I just opened that letter in time I would have saved at least 100$ just by reading and replying in a timely fashion. It could have been worse though. Ignoring bills and notices can stack up huge interest and fines. I learned my lesson. Hopefully I’ve just spared you the need to learn from your own experience as well.